This advanced ReaxFF tutorial will teach you how to calculate the discharge voltage profile of a LiS battery. Results: How to calculate the discharge voltage profiles. 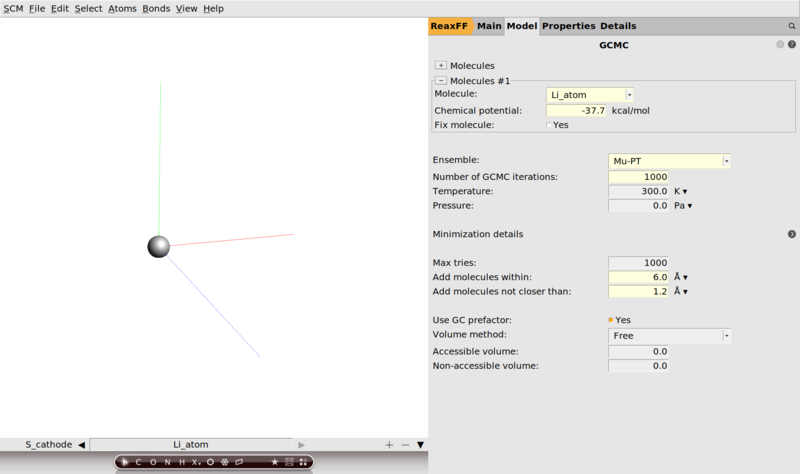 This tutorial uses a small alpha-sulfur system consisting of 128 atoms. Both the system and the workflow presented here are originally described in the publication “ReaxFF molecular dynamics simulations on lithiated sulfur cathode materials” by M.M.Islam et al. The discharge process is simulated using ReaxFF in a grand canonical monte carlo scheme. Volume changes upon lithiation are accounted for by using an NSPT-μLischeme. The discharge voltage can be calculated from the total energies of the lithiated compounds. The crystal structure can be directly imported from a CIF file. There are several resources for crystollgraphic data available online and you can choose according to your liking. Here we use a structure of S8 alpha sulfur from the American Mineralogist Crystal Structure Database. The latter two steps map the coordinates into the ReaxFF unit cell and display the lattice vectors. 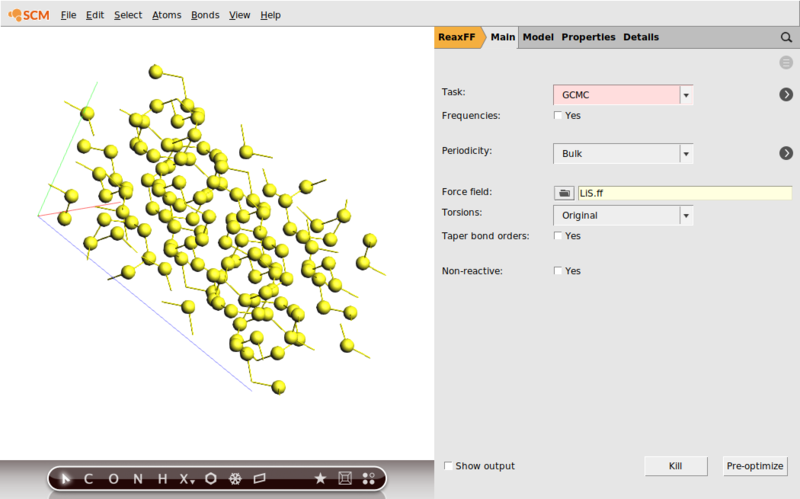 Before adding any Li-ions to the system, we need to relax the structure using a geometry and cell optimization, i.e. including the optimization of lattice vectors. Often we find that running a couple of hundred steps NPT dynamics at low temperature and 0.0 pressure using a small timestep is sufficient as a relaxation or at least speed up a subsequent geometry optimization significantly. 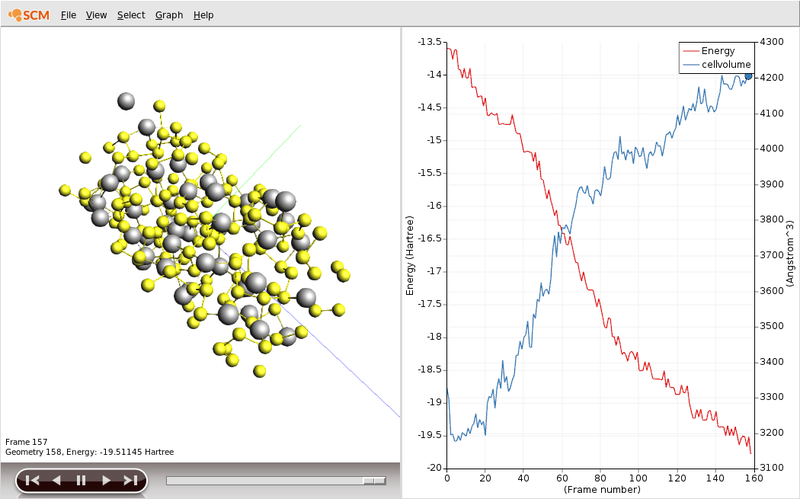 Optimize the resulting structure and lattice using the same settings as with the sulfur. After the optimization has finished successful, the chemical potential is calculated as the total energy / number of atoms. The exact value depends to some minor extent on the chosen force field and for consistency one should always use the value predicted by the force field at use. GCMC calculations are quite sensitive to the chosen settings. The main reason being the interplay of comparing small energy differences in the GCMC acceptance criteria and the optimization procedure carried out after each MC-trial move. Its advised to try different optimizer settings (max. steps, convergence criteria, etc...). The GCMC settings are documented online (here). The ADF development version (>= r62841) comes GUI support for GCMC calculations. We will be using the GUI in this tutorial but the same calculation can be run from the commandline as well. This will be enough steps to converge the current system. However, this value is not known beforehand and one might want to choose a larger number of iterations for larger systems. These fields correspond to the Rmax and Rmin values in the GCMC input. You can try different values here. As a complete empirical rule of thumb: setting Rmin to roughly ½ of the shortest expected bond and Rmax approx. half of the shortest lattice vector seems a good starting point. The number of attempted tries must be sufficiently large. If this is not the case, the calculation will abort with an error message stating that number of max tries was exceeded. Save your changes and run the calculation. The initial stages of the calcaulation are reached quite fast and the progress can be followed in ADFmovie. However, it will typically take a bit less than one day until convergence. The obvious: Try a smaller system. where \(G\) denotes the Gibbs free energy and \(x\) the concentration of Li-ions. The enthalpic (PT) and entropic (TS) contributions can be neglected and thus the Gibbs free energy replaced by the ground state energy. In this case and many other cases of non-standard trajectory analysis, writing a short Python script using the PLAMS library is the most efficient way to obtain results. Remember there is no need to take any further action than writing the script: Both Python and PLAMS are shipped with every copy of ADF/ReaxFF. M. M. Islam, A. Ostadhossein, O. Borodin, A. Todd Yeates, W. W. Tipton, R. G. Hennig, N. Kumar and A. C. T. van Duin ReaxFF molecular dynamics simulations on lithiated sulfur cathode materials, Phys. Chem. Chem. Phys. 17, 3383-3393 (2015).